Marathon talks aimed at charting mankind's path away from climate catastrophe entered overtime Saturday as nations picked over a plan presented by host Poland that exposed several sources of disagreement. Negotiators told AFP that the nearly 200 states involved were still far apart on several crunch issues -- from how nations report reductions in greenhouse gas emissions, to the levels of help given to countries already hurting from climate change. 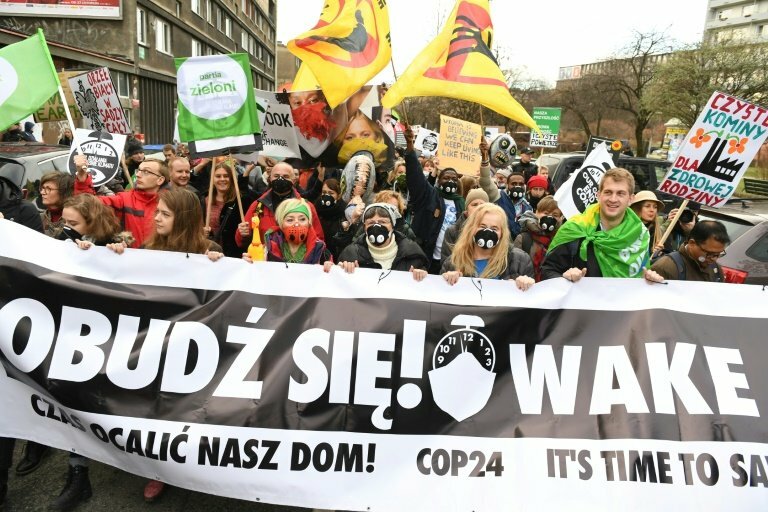 Ministers at the COP24 talks must agree on a common rule book to make good on promises they made in the landmark 2015 Paris accord, which vowed to limit global temperature rises to "well below" two degrees Celsius (3.6 degrees Fahrenheit). But with the starkest warnings yet from scientists highlighting the need to slash fossil fuel emissions within the coming decades in order to meet the safer cap of 1.5C warming, delegates were urged to act now or condemn at-risk nations to disaster. The summit was meant to wrap up at midnight Saturday but overran into the small hours as areas of dispute emerged, often with different alignments of developed and developing nations straddling each divide. UN secretary-general Antonio Guterres made his third trip in two weeks to the COP24 in the Polish mining city of Katowice in a bid to push a deal over the line. The draft text included no resolution on how the climate fight will be financed, and developed nations -- responsible for the lion's share of historic greenhouse gas emissions -- were accused of seeking to shirk funding promises made in Paris. One veteran observer told AFP that the US, despite president Donald Trump's intention to withdraw from Paris, was seeking to water down "differentiation", a bedrock principle of the underlying UN climate Convention. Washington wants countries to contribute to the climate fight based on their current emissions levels, rather than their historic pollution, meaning the US would be less bound to help developing nations green their economies. Mohamed Adow, Christian Aid's International climate lead, said the US delegation was "like a bad smell" at the summit. "It's notable that the US is still working to water down negotiations for an agreement that they have said they are going to withdraw from." The draft text gave short shrift to another red-line issue for poor countries exposed to the ravages brought on by global warming: so-called "loss and damage"
This provision is designed to help nations cope with deadly heatwaves, drought and floods -- amplified by climate change -- happening today. Another hot-button issue centres on how to avoid the double-counting of reductions in carbon pollution. That can occur when one country takes actions to curb emissions -- reforestation, for example -- in another country and then both nations claim the credit as part of their pledges under the Paris Agreement. "If you have buyers and sellers in a carbon trading scheme, you want to be sure that those emissions reductions don't get counted twice," said David Waskow, director of the World Resources Institute's Climate Change Initiative. The Environmental Defence Fund said Brazil had asked to insert language in the text muddying the date at which the rule book would compel countries to stop double counting emissions savings. "If Brazil's language is allowed to stay, it will embed the double counting of emissions reductions in the Paris Agreement... undermine the ability of carbon markets to drive emissions down," said EDF's Alex Hanafi. Chile on Friday announced it would hold next year's UN climate summit, after Brazil pulled out last month citing the cost of holding the two-week talks. One potential breakthrough came in the form of tentative consensus over how to treat the latest UN scientific report. Most nations wanted the findings of the Intergovernmental Panel on Climate Change (IPCC) -- which highlighted the need for greenhouse gas emissions to be slashed to nearly half by 2030 in order to hit the 1.5C target -- to form a key part of future planning. But the US, Saudi Arabia, Russia and Kuwait objected, leading to watered down language in the draft decision. As well as the IPCC issue, nations are also under pressure to up their ambition in their contributions to the climate fight ahead of a 2020 stocktake. "If we don't do that, we will not survive," said former Maldives president Mohamed Nasheed. "We would die. I'm sure it wouldn't be an appropriate outcome for anyone."